What does it take to be an astronaut - a guide provided by www.spacekids.co.uk ! Ever wondered what it takes to become an astronaut? Being an astronaut is a dream for lots of children. But what sort of person can become an astronaut? What skills would you need to be chosen as a trainee astronaut? How would you train for a mission in space, and what sort of experiences would you expect once you got there? Read on to find out what it takes to become part of an astronaut crew like the one you see in the picture above, floating weightless in the International Space Station. 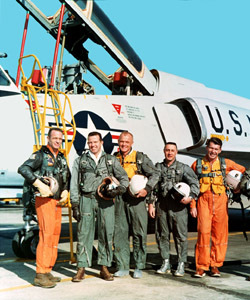 The first astronauts were military fast jet and test pilots. They were chosen for their quick reactions, and experience in flying difficult, experimental aeroplanes. Yuri Gagarin, first man in space was a jet fighter pilot, as were all seven of the first NASA astronauts (see left). They were used to speed and danger, and enjoyed the challenges of trying things nobody had ever done before. A famous author, Tom Wolfe wrote a book about astronauts and he called it 'The Right Stuff', to try to describe their skills, confidence and bravery. Because of their daring exploits, these men became famous around the world. 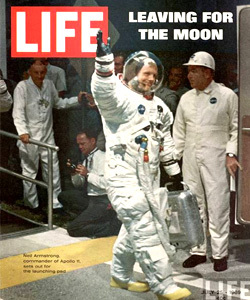 On the right you can see a magazine cover featuring Neil Armstrong, who would be the first man to walk on the moon. Before Armstrong became an astronaut, he had been a test pilot for the X-15, the fastest aeroplane ever built. 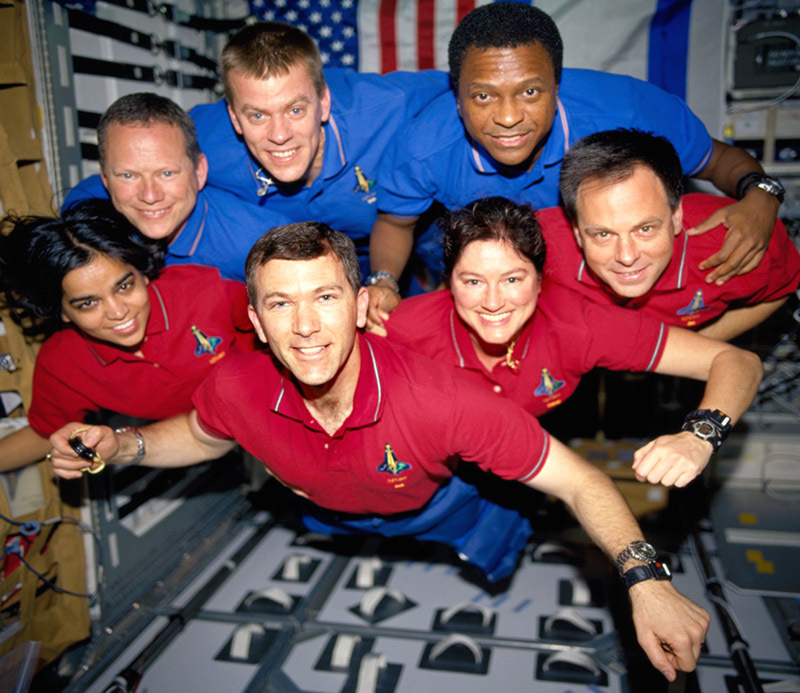 All astronauts undergo years of intensive training before they can fly on a space mission. Space travel is incredibly expensive, and there can be terrible danger if anything goes wrong. Astronauts train for years at a time so they have all the skills and knowledge they might need on a mission. Crews must be able to know exactly what to do all the time, even how to deal with emergencies. They must react to any problems to save themselves, and the spacecraft they travel in if possible. Astronauts learn what it feels like to be weightless in a special aeroplane left), and spend a lot of time practicing on the ground in special machines that simulate how everything will feel in space. They often train in swimming pools as this helps them feel weightless too. There is an enormous amount of preparation for every space mission. Not only do crews need to know about the things all astronauts experience, like weightlessness and how to use a space suit, they also need to learn skills that are specific to their own missions. 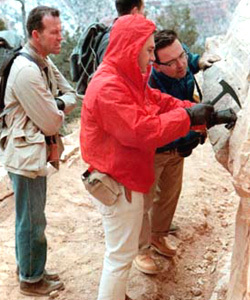 In the picture on the left, you can see some Apollo astronauts, being trained by a geologist. Apollo crews visited the moon, and they had to know about rocks and soil so they could understand what they saw on the moon's surface, and choose the best samples of rock to bring back to earth. 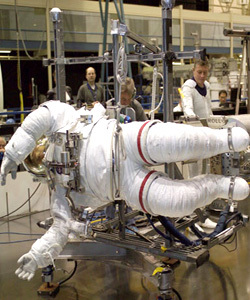 Astronauts also have to train with equipment or space craft that will be used on their mission. On the right you can see Neil Armstrong and Buzz Aldrin, practicing in a Lunar Module simulator, where they are learning how to fly the spacecraft that will land them on the moon. The opportunity to visit space is an exciting adventure, but it is also quite a challenge for astronauts. 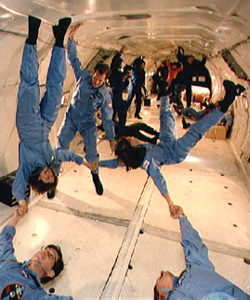 Zero gravity takes some getting used to - being weightless feels weird, and it even makes some people feel space-sick! 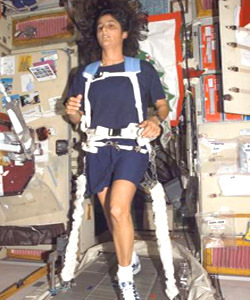 Being weightless for longer periods of time makes muscles and bones weaker, and astronauts spending time in a space station must exercise everyday to try to stay fit. Every astronaut is monitored by scientists before, during and after a mission, so they can learn more about the effects of space travel on humans - in a way astronauts bodies are used as experiments! The simplest things are difficult in space - eating and going to the toilet require special equipment and training. 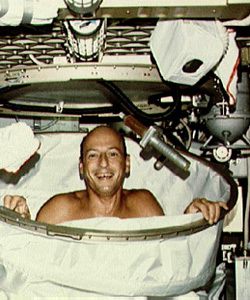 The picture on the right shows a Skylab space station astronaut having a shower! 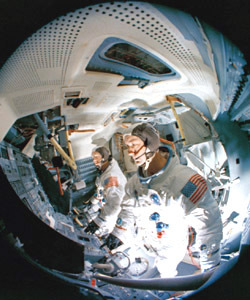 Astronauts use the very latest computer technology in training and in space. 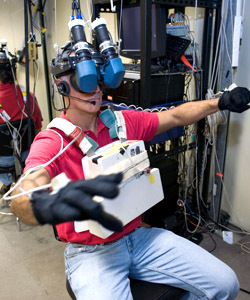 Astronauts use a virtual reality headset to practice mission skills (right), so they can see and try to do the things they will have to do when they get to space. 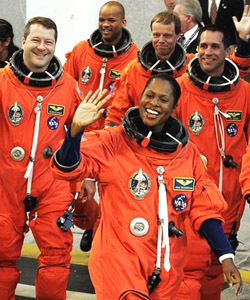 NASA expects all astronauts to be well educated - at least to degree level. Wannabe Shuttle Pilots must have lots of aeroplane flight experience. Mission Specialists, who work and conduct experiments in space need lots of professional experience, working as scientific or technology experts for 3 years before they can become astronaut trainees. Nowadays, astronauts are not only selected from fast jet or test pilots. Modern astronauts are just as likely to be computer experts, or scientists, with technical skills and expert knowledge that will be useful in space. There are lots of women astronauts now too! Why not visit the Spacekids online shop which stocks space related toys, including replica space suits, astronaut pyjamas and space themed tee shirts.